The TM-1 is the newest addition to Roland’s vast hybrid drumming arsenal, and is aimed squarely at drummers yet to dabble in the hybrid world, but who want to bring a wider range of sounds to their performances. The small trigger module features a pair of mono inputs (which can also be used for one stereo pad) for expanding your acoustic drum kit with pads or triggers. As a result you can enhance your acoustic drum sound by layering electronic sounds or expanding the range of sounds at your disposal. The TM-1 comes preloaded with a range of sounds - expect the usual 808 sounds, hand claps and percussion - meaning you can get going straight away. If you’d prefer to add your own sounds, like a snare sample from your band’s latest album for example, you can manage and add your own using Roland’s Wave Editor software for PC, Mac, iOS and Android. 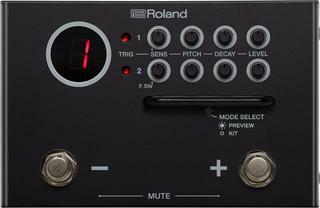 Sounds can be enhanced further via Pitch, Decay and Sensitivity controls on the module itself. Control of the floor-friendly unit comes via a pair of footswitches which enable you to select or mute your sounds with ease. Particularly handy for making changes on the fly during a gig. *The Application ‘TM-1 Editor’ is required. *When setting the Output Setting to the "MIX", The mixed sound of trigger 1 and 2 is output in mono. *When setting the Output Setting to the "INDIVIDUAL", Each trigger is output separately to left and right (TRIG1: L-Side, TRIG2: R-Side). 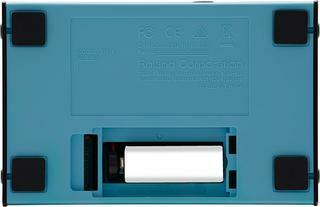 *It depends on the batteries' specification, capacity, and conditions of use.